A traditional knitting technique gets a new and easier spin, so that even beginners can master the process. Just dip into this comprehensive course, with themed tutorials--each with handy practice exercises--as well as simple instructions, charts, and 29 fabulous projects. 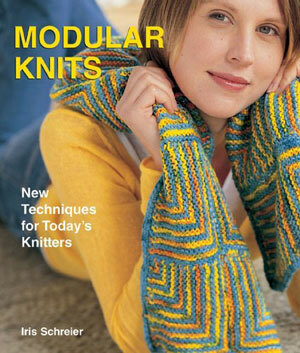 Modular knitting is a bit like a game: you create designs in the same way you'd work a jigsaw puzzle--piece by piece. Start by completing one square, cube, or diamond, and then build on that by knitting additional basic figures and forms. Although the finished product looks complex, with its variety of shape and color changes, it's actually not hard at all. Start with a very easy patchwork square pillow, and move onto the rounded market bag, triangle hat, and zigzag scarf.